You are here:Home Vocal Technique What Skills Does a Singing Teacher Need? If you are considering a career as a singing teacher, or examining how to be a better one, here are some tips that may help you to be a better singing teacher. First and most importantly, a singing teacher needs to have good ears! That is: the ability to listen, assess and diagnose tendencies and habits in students is crucial. 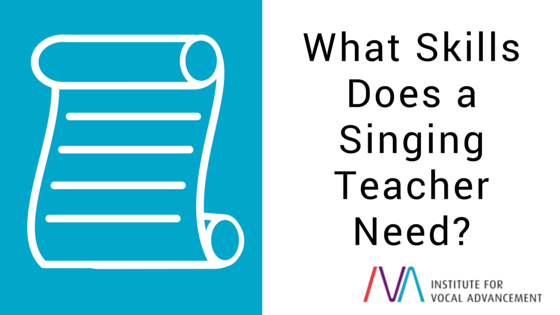 Searching for what is missing and what is needed in a voice is an important skill for a singing teacher. One has to diagnose correctly before one can prescribe exercises or changes. Secondly, the tools and exercises prescribed must be in line with what the student needs to improve. Have you ever been to a singing teacher who does the same exercises with every student? The same exercises will not work to improve every voice! So being able to bring a voice into the right function and balance with appropriate exercises is crucial. A good singing teacher has a clear understanding of passages in the voice, and seeks to help students learn how to navigate them smoothly. Being aware of the differences and natural “color” between an alto and a soprano, for instance, can come into play as well, so as not to work a voice in a damaging or counter-productive way. A good singing teacher doesn’t have to be a great accompanist, but “have” an ability to play, at least, the most useful scales in all keys. Their ability needs to be good enough they can focus on the student and not have to look at their hands. Being good with people and able to tune into how they learn, how they understand things, and how they respond, is important. A great teacher can read that and teach right to the level of the student in front of them, taking note of emotional things that may get in the way and scoping out what approach is going to work best for them. A good teacher will get the student to buy into the process, so they are aware of what they need to work towards and why – how they will benefit from it. A singing teacher should continue to maintain their own voice. Their own vocal development is important, so they can demonstrate what they want. They may have to go toe-to-toe with a great singer! A good teacher can get a singer into the right function sometimes without even saying a word to them, but rather, just using the right exercises to do it. They never use descriptive phrases like “place the sound here or there”. Once they have the student in the right function, they might check in so that the student will notice what it feels like to them, since every person may experience different sensations. It can take some time to develop these skills, but with a lot of experience, dedication and study it will happen! As a vocal teacher who is growing and developing these skills, I really am proud to be part of an institute that assists in these areas that you have described above, regarding “What Skills does a Singing Teacher need?” I’ve experienced from most, if not all Master teachers their willingness to helping me as a teacher learn to meet these requirements and turn them into assets, which I believe have helped me with my students, and are valuable for any vocalist with a purpose. This knowledge has helped assist me in helping teachers and preachers who also want to be able to use their singing voice, whether its in a congregation, solo performance or teaching collective people a song. Although there is still much more to learn, and I’ll always be learning, its an adventurous journey, challenging but I believe its worth it, especially when you begin to see the difference in your students attitude towards their voice, singing and their whole persona.